Agricultural producers from Kansas and Germany met at K-State on Aug. 16 to discuss agriculture’s role in greenhouse gas reductions, and see firsthand the field research on carbon sequestration being conducted by K-State’s CASMGS research team. The discussion was part of the US-German Farmer-to-Farmer Exchange sponsored by Environmental Defense, a US-based nongovernmental organization. Producers from Kansas who talked about their experiences with no-till management included Justin Knopf, Saline County; Merle Holle, Marshall County; Craig Good, Pottawatomie County; Donn Teske, Pottawatomie County and president of the Kansas Farmers Union; and William Hill, Jackson County. Bruce Wells and Gary Satter, USDA-NRCS Resource Conservation and Development conservationists and members of the Kansas Coalition for Carbon Management, discussed the participation of Kansas producers in the carbon credit pilot project from the Chicago Climate Exchange. Chuck Rice, K-State professor of agronomy and national CASMGS director, presented an overview of agriculture’s role in greenhouse gas mitigation to the group and demonstrated the research on no-till continuous corn at K-State’s Agronomy North Farm. Scott Staggenborg, K-State associate professor of agronomy, showed the group the bioenergy crops being tested at the North Farm – including switchgrass, miscanthus, sweet sorghum, photoperiod-sensitive forage sorghum, and others. Staggenborg also demonstrated a computer model he is developing to predict soil carbon storage levels based on crop rotations, tillage systems, soils, and environmental conditions. Q: Concerning carbon credits from soil carbon sequestration, what about the issue of additionality? A: “Additionality” is the term for the issue of paying someone to implement a certain carbon-sequestering practice that they would have done anyway (or have already been doing), even without getting paid for it. The concern is that money would be better spent trying to get someone to do something new to sequester more carbon, rather than paying someone to just keep doing what they’re already doing, or would do anyway even without getting paid. This issue was discussed as the IPCC report was being written, and the general consensus was that it’s not helpful to reward only those producers who are just now switching to no-till. It’s only fair to reward all no-till producers, regardless of how many years they have been no-tilling, by recognizing their carbon credits for sequestering carbon. Q: How long can soils under no-till management keep increasing carbon sequestration? A: About 20 to 30 years, depending on the soil type, climate, and crop rotations. Q: Even if no-till can sequester carbon in the soil, but about the complete balance of greenhouse gases with no-till? Doesn’t no-till increase nitrous oxide emissions? Doesn’t no-till result in more chemical use? A: Overall, the GHG balance with no-till has been shown to be favorable, but more research definitely needs to be done on this. The results vary somewhat by region and cropping systems. No-till sometimes requires more chemical use than conventional tillage, but not always. In all cases, the reduction in fuel use with no-till is a major factor in reducing greenhouse gas emissions. Q: Can you afford to do good measuring and monitoring of soil carbon levels so that carbon credit buyers can have adequate confidence in the quality of what they’re buying? A: This depends of the price of carbon credits. If buyers require that every field is sampled and analyzed for carbon every year, then the price of carbon credits will have to be high enough to justify the costs. We are working on finding other, less expensive and quicker measuring techniques. Soil carbon levels can be accurately measured with current technology, and this can be replicated and verified. These measurements are being used to validate management practices. It is relatively inexpensive to verify that certain required management practices are actually occurring for purposes of carbon credit offset trading. But if the actual soil carbon level of every field had to be tested every year, that would be expensive. Q: Why isn’t there more no-till in the U.S.? How many acres in the U.S. could potentially be in no-till? A: No-till is increasing in the drier regions of the Central Plains. In the Corn Belt, soils tend to be wet and cold in the spring for corn planting, and no-till can make that problem worse. As a result, no-till is not used much as much for corn as for soybeans, which are planted later in the spring after soils have warmed up. Strip-till is becoming more popular in the Corn Belt, and is accepted by the Chicago Climate Exchange in its soil carbon offset program. Q: Are biomass crops for energy being produced in Kansas? A: Not yet. There are no ethanol plants in operation in Kansas that utilize biomass. We are testing some of the more promising biomass crops (switchgrass, miscanthus, sweet sorghum, and forage sorghum) at K-State to see which ones will be best adapted. Figure 1. 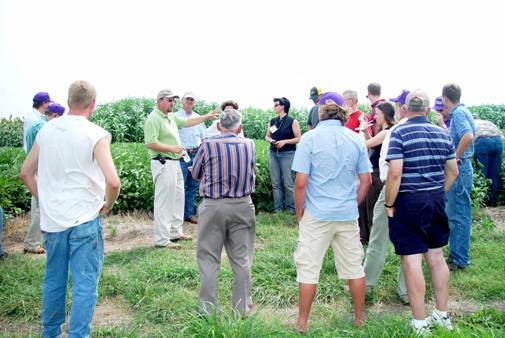 Chuck Rice, K-State professor of agronomy (center, with purple hat and shirt), explains K-State's no-till corn research to the group of German and U.S. farmers. Figure 2. 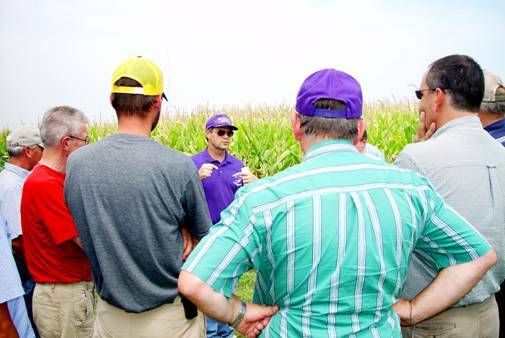 Scott Staggenborg, K-State associate professor of agronomy, (in white slacks and sunglasses, holding water bottle), discusses the biomass energy crop plantings at K-State. In the background is the tall, photoperiod sensitive sorghum. 2. Voluntary markets (operating in countries that have not ratified the Kyoto treaty, such as the U.S.). There are significant differences in these markets, both in terms of how they operate and market prices for carbon credits. Agricultural producers and others in the U.S. who hope to sell carbon credits someday, or already are selling credits, should have a basic knowledge of these markets so they know what to expect. The following is a brief summary of the two basic types of carbon markets in operation today in the U.S. and abroad. This is also sometimes called the “regulated” carbon market, and came about as a direct consequence of the Kyoto Protocol. Most developed countries in the world, except for the U.S. and Australia, ratified the Kyoto Protocol, which established legally binding targets for greenhouse gas (GHG) reductions. These countries have been termed “Annex I” countries. Industries and governments in these countries had to meet specific targets for reductions. Those that could not meet their mandated reductions were allowed to enter the marketplace to buy carbon credits or emission reduction units. To enable compliance the Protocol established Flexible Mechanisms to allow these countries to meet their targets by trading carbon credits or emission reduction units. These mechanisms are: the Clean Development Mechanism (CDM); Joint Implementation (JI); and Emissions Trading. In addition to this, several nations and groups of nations have developed their own trading mechanisms to help them meet their targets; the biggest of these is the European Emissions Trading Scheme (EU ETS). * The Clean Development Mechanism (CDM). This mechanism allows Annex I countries to buy carbon credits from emissions-reducing and emissions-saving projects in developing countries. These projects generate emissions credits called Certified Emissions Reductions (CERs) which can then be bought and traded. One CER is equal to one tonne of carbon dioxide equivalent gases. To be recognized, CDM projects have to demonstrate that they create savings which are additional to anything that might have happened anyway — a concept known as “additionality.” An authorized third party called the Designated Operational Entity is responsible for the verification and certification of the project. Verification involves on-site inspection and review. The certification procedure provides written assurance that the project has achieved the claimed emissions reductions. A CDM “Gold Standard” has been developed by a group of NGOs led by the World Wildlife Federation-UK. CDM projects are restricted to renewable energy and end-use energy efficiency projects, and are also assessed via a scoring system on their environmental, social and economic impacts on sustainable development. The standards for acceptance as a certified CDM project are costly and have often proven to be difficult to achieve. * Joint Implementation (JI). This mechanism is similar to the CDM mechanism, except that the emissions-reducing projects are in other developed countries, rather than developing countries. These projects generate tradable credits which are called Emission Reduction Units (ERUs). As under the CDM, projects must demonstrate additionality and go through a similar verification and certification process. * Emissions Trading. The Kyoto emissions trading scheme is a cap-and-trade scheme. In a cap-and-trade system parties are given an emissions allowance based on an emissions reduction target. A limited number of allowances are issued equal to the “global” GHG emissions reduction target. In the Kyoto scheme each allowance is called an Assigned Amount Unit (AAU), which is equivalent to one tonne of carbon dioxide. The implementation of this process can seem a little complicated. At the end of a period each party must hold enough AAUs to equal the amount of greenhouse gas it emitted. This allows parties to decide whether to reduce their emissions internally, or to buy credits from other parties. * The EU Emissions Trading Scheme (EU ETS) began in January 2005 and is the largest emissions trading scheme, covering 12,000 installations in 25 countries. The trading units in this scheme are called EU Allowances (EUAs). Parties in this scheme can buy and sell EUAs, or they can purchase—within certain limits—CERs from the Clean Development Mechanism or ERUs under Joint Implementation. The EU ETS has become a significant factor in reducing emissions across Europe. This is also sometimes called the “unregulated” carbon market. Those in the U.S. may look at the carbon trading activity in Europe, and especially at the prices that carbon credits are bringing overseas, and see that prices for carbon credits are much higher than on the voluntary market in the U.S., through the Chicago Climate Exchange (CCX). That’s one difference between a compliance and a voluntary carbon market. Not only is the basic rationale for carbon trading different in a voluntary system, but there is no agreement yet on what standards should be used to verify these voluntary carbon credits. The Voluntary Carbon Market includes more than just business and organizations in the U.S. Both within and outside the U.S., individual consumers and others not included in the Compliance Carbon Market can also buy credits in the Voluntary Carbon Market. One advantage of the Voluntary Carbon Market is that participants can buy both credits which originate from the compliance market and credits which originate from the voluntary market. It is not always very clear to buyers exactly which type of credit they are buying. Carbon credits generated within the Voluntary Carbon Market are recognized only within the particular trading scheme with which they are associated, unlike credits generated within the Compliance Carbon Market. In other words, the Voluntary Carbon Market credits are not universally recognized credits that can be marketed on any trading scheme in the world. The most widely used Voluntary Carbon Market in the U.S. is the Chicago Climate Exchange. The CCX trading scheme is a legally-binding market where parties can set self-imposed, GHG emissions reductions targets. * The Voluntary Gold Standard (VGS). Launched by World Wildlife Federation-UK in May 2006, the Voluntary Gold Standard is a simplified version of the CDM Gold Standard (mentioned above). The methodology creates Voluntary Emissions Reduction Units (VERs). The VGS is only available for projects in developing countries. * The Voluntary Carbon Standard (VCS). The Voluntary Carbon Standard has been developed by The Climate Group and the International Emissions Trading Association. Version 1 of the VCS was released for consultation in March 2006. Version 2 is in development. The VCS has creates a unit called the Voluntary Carbon Unit (VCU). The Voluntary Carbon Standard aims to ensure that all voluntary emission reductions projects are independently verified. The VCS will provide protocols and criteria to certification entities and project developers. The VCS has created a registry managed by the Bank of New York. * The Climate, Community and Biodiversity Standards (CBB). These standards were developed by the Climate, Community and Biodiversity Alliance. They are for "land-based projects that can simultaneously deliver compelling climate, biodiversity and community benefits." There are three levels of CBB validation: approved, silver, and gold. An independent third party evaluates whether the project merits approval, and if so, at what level. The standard uses the methodologies of the Intergovernmental Panel on Climate Change Good Practice Guidance (IPCC GPG), but can also used approved CDM methodologies for calculating carbon reductions/ savings. * Nicholas Institute for Environmental Policy Solutions. A new “how-to” manual for reducing U.S. greenhouse gas emissions through land-use sequestration in farmlands and forests, and turning those reductions into verifiable credits for trading in carbon markets, is about to be released. Duke University Press will publish Harnessing Farms and Forests in the Low-Carbon Economy: How to Create and Verify Greenhouse Gas Offsets, a technical guide for farmers, foresters, traders and investors, in June. A preview of the guide is available online at http://www.nicholas.duke.edu/institute/ghgoffsetsguide/ Duke’s Nicholas Institute for Environmental Policy Solutions developed the guide in collaboration with the nonprofit advocacy group Environmental Defense, and scientists from Kansas State University, Texas A&M University, Colorado State University, Rice University, Princeton University, and Brown University, as well as other experts. The guide explains how farmers and foresters can convert their land’s carbon dioxide storage capacity into revenue-generating “offsets” that can be bought and sold in future carbon markets. Providing recommendations for specific land-use practices and formulas for calculating sequestered carbon, the book provides technical information needed by quantifiers, verifiers, and traders of the offset credits. * The Plan Vivo System. This system offers a standard for "managing the supply of verifiable emission reductions from rural communities in a way that promotes sustainable livelihoods." The Plan Vivo System is managed by BioClimate Research and Development, a not-for-profit organization. Projects are usually monitored using local experts, and credits are registered on a database. * Verified Emission Reductions. To add confusion to the matter, voluntary offset retailers have developed their own standards to create credits with the generic term of Verified Emission Reductions (VERs). This is not to be confused with Voluntary Emission Reductions used in the “Gold Standard” system. In the Gold Standard system, the emissions reduction or saving uses a single set of standards. In the Verified Emission Reductions system, the standards vary widely in many respects including how the project baselines are calculated, how additionality is tested, and how verification is carried out. For some projects, this is not done at all, which reflects the cheaper cost of some of these credits in the voluntary market. It is up to the buyer of credits to determine what standards they want their credits to meet. Consequently these sorts of credits are neither comparable nor tradable. * Proposed Government Code in the UK. In January 2007 the UK’s Department for Environment, Food and Rural Affairs (DEFRA), launched its consultation on establishing a voluntary code of best practice for the provision of carbon offsetting the UK customers. Its purpose in establishing the code is to "ensure consumer confidence in an emerging market and continued growth of that market through that confidence." The code would apply only to compliance market credits being traded in the voluntary market, principally, CERs. The Voluntary Carbon Standard (VCS) will be a global benchmark standard for project-based voluntary greenhouse gas emission reductions and removals. It will offer confidence to buyers, sellers, and other stakeholders in the growing voluntary carbon market. The VCS was devised by The Climate Group and developed in partnership with the International Emissions Trading Association (IETA) and the World Economic Forum GHG Register, and a range of business, government, and non-government organizations. Version 1 of the VCS was released for consultation on March 28, 2006 and received written comments from 65 Climate Group and IETA members, partners, and external stakeholders. Consultation meetings have also been held in the UK, Germany, US, and Japan, along with interested stakeholders. A draft Version 2 of the VCS was released on October 18, 2006 and received comment from around 60 stakeholders. The VCS is currently being finalized by an independent Steering Committee for final launch in 2007. Rules for certification under the VCS will be as robust as those of the Kyoto Protocol’s Clean Development Mechanism, while attempting reduce the costs for participants. The voluntary carbon market grew by 200 percent last year, and is expected to set more records in 2007, according to a report released recently. The Ecosystem Marketplace and New Carbon Finance commissioned "State of the Voluntary Carbon Markets 2007: Picking Up Steam," an assessment that analyzed current trends, buyer motivation and pricing history. The results included predictions that the market would continue growing in leaps and bounds, despite potential future legislation. The report valued the global carbon market at $91 million in 2006, with about 23.7 million tons of carbon dioxide emissions transacted. The volume-weighted average price was $4.1 per ton. Projects with strong quality and verifiable attributes, such as landfill methane, coal mine methane and forestry, commanded the highest prices. During the last five years, the number of companies supplying carbon credits has grown by 200 percent. Projects that involve forestry sequestration, renewable energy and industrial gases accounted for the bulk of projects, the report said. The market provides ample opportunity for smaller projects that generate less than 5,000 tons of carbon emissions. North American and European markets drove most of the demand in the voluntary carbon market, the report found. Survey respondents reported that 68 percent of their customers are based in the United States and 3 percent in Canada. The European Union accounted for 28 percent of respondents' customers, and more than 30 percent of suppliers of carbon offsets. Overall, the largest buyers of carbon offsets were businesses. The report found that corporate social responsibility drove the market, with large gains coming from North American markets. The ran counter to researcher expectations, who anticipated that the possibility of future regulation would play a larger role in the decisions to buy carbon offsets. The report urged the implementation of industry standards, certification and verification processes to reduce the "buyer beware" market. Six western states (California, Arizona, New Mexico, Oregon, Washington, and Utah) -- along with British Columbia and Manitoba, Canada – have joined together as the Western Climate Initiative (WCI). The WCI members met in early August and established a regional goal to reduce greenhouse gas (GHG) emissions to 15 per cent below 2005 levels by 2020. This target is expected to lay the foundation for a common cap and trade system. The WCI will use its new regional goal in designing a regional, market-based, multi-sector mechanism, such as a load-based cap and trade program, by August 2008. Any emissions trading market formed by the Western states could be linked to the Regional Greenhouse Gas Initiative (RGGI), a mandatory cap-and-trade program planned by a group of seven Northeast States. Connecticut, Delaware, Maine, New Hampshire, New Jersey, New York and Vermont will limit emissions to current levels beginning in 2009, and make incremental reductions to achieve a 10 percent cut by 2019. Currently, four other U.S. states (Kansas, Colorado, Nevada, and Wyoming), three other Canadian provinces (Ontario, Quebec, and Saskatchewan) and one Mexican state (Sonora) are participating as observers of the WCI's deliberations. Some of these entities, as well as others, may seek to join the WCI as full members in the future. A compromise global warming plan was released August 2 in the Senate by Sens. Joe Lieberman (I-Conn.) and John Warner (R-Va.), calling for a 70 percent cut by mid-century in the greenhouse gas emissions produced from a large swath of the U.S. economy . Under the draft proposal, electric utilities, major industrial manufacturers and petroleum refiners and importers would be required to limit their emissions to 2005 levels beginning in 2012. Those sources must then cut their greenhouse gases 10 percent by 2020, with an end target of a 70 percent reduction in 2050. As in many other proposals before them, industries covered under Lieberman and Warner's new U.S. carbon market would be able to purchase credits for compliance through a cap-and-trade program. More than half of the annual pollution credits -- likely worth at least tens of billions of dollars -- would be distributed for free to the power companies and manufacturers most directly confronted with new requirements. The Lieberman-Warner plan allows industry to meet up to 15 percent of its emission requirements through the purchase of carbon offsets, such as sound farming and forestry practices and methane capture. The formal legislation, the senators said, would include “detailed, rigorous requirements" to make sure the offsets represent "real, additional, verifiable and permanent emissions reductions." The US Forest Service and National Forest Foundation are teaming up to start a voluntary carbon offset program aimed to fund reforestation projects in US forests. The plan will allow consumers to make donations to fund tree planting and other work in national forests by calculating their carbon footprint and then donating money to the program, known as the Carbon Capital Fund. For $6 an individual can offset one metric ton of CO2 and the money will go to forests damaged by wildfires, tornadoes, and other catastrophic events. It is estimated that US forests offset about 10 percent of CO2 emissions in the US and that terrestrial sequestration could greatly increase that percentage. Other benefits include clean watershed and improved species habitat. The Forest Service has identified two projects to kick off the new program, including a 500-acre reforestation project in Custer National Forest in Montana and 1400 acres in Payette National Forest in Idaho . The article below shows how “additionality” concerns can backfire. In this case, carbon credits are being given only to those who plant new forests, not to those who would protect existing forests. The theory is that money should be paid only to projects that add additional carbon sequestration activity to the ecosystem, and no credits should be spent on efforts or projects that only protect existing activities, without adding anything new. The end result, in this case, is that there is actually an incentive for landowners or governments to cut down existing forests so that they can be rewarded later with carbon credits for planting “new” forests. This same principle would apply to agricultural carbon credits for no-till production. If carbon credits were only given to those who are just now putting their land into no-till production, that would encourage those who have been practicing no-till for some time to till their ground so they could start over and get carbon credits for “new” no-till ground. The current carbon market actually encourages cutting down some of the world's biggest forests, which would unleash tonnes of climate-warming carbon into the atmosphere, a new study reported on Monday. Under the Kyoto Protocol aimed at stemming climate change, there is no profitable reason for the 10 countries and one French territory with 20 percent of Earth's intact tropical forest to maintain this resource, according to a study in the journal Public Library of Science Biology.